Thursday 6th January 1916: Following the canvassing for recruits which took place late last year under Lord Derby’s recruitment scheme we are now able to report on the effect of the scheme in Bedford and North Bedfordshire. In the National Register the names of 3040 men of military age in Bedford were not starred as being engaged in essential occupations. Between November 1st and December 12th 533 single and 893 married men enlisted and attested; a further 78 single and 39 married men had already enlisted between August and October. The total number of new recruits was therefore 1543. The remaining 1497 who had not either enlisted or attested were made up of 213 single and 556 married men who refused to enlist, 237 single and 269 married men who were medically unfit, 27 single and 56 married men who were engaged in munition work but not starred, and 47 single and 91 married men willing to enlist on conditions. If compulsion is to be applied to single men, then there are only about 213 (under 300 at the outside) who can be conscripted, and it is likely that only about 40% of these would be found to be fit. There is likely to be little opposition if these men are made to toe the line. In North Bedfordshire 4,973 men were canvassed. Of these 775 single and 886 married men either enlisted or promised to enlist. 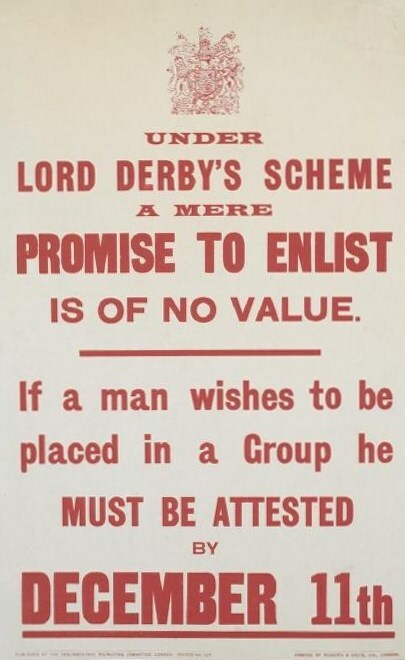 Current figures suggest that after allowing for those who were unfit or unable to enlist for other reasons 927 single and 1378 married men refused to enlist. These figures should be treated with caution as it is thought that many more may have enlisted during the final days of the scheme. It seems likely, however, that conscription of single men would be more effective in the area around Bedford than in the town itself.